First thing to do today is to get myself a Permit for Foreigners to Travel. They will hand out this permit only once, so it is important to have a clear plan, at least in terms of destinations. The permit will, apart from your personal data, read something like "Permit to travel: Asmara - Barentu - Asmara - Senafe. Valid from 27-05-2005 up to 08-06-2005", and permission is granted to stay in and travel through any village in between. The permit covers the whole time span of my stay in Eritrea, starting from today, allowing for some delay or change of plans. On my way to the bus station, I visit a supermarket to buy some necessities and at the market I buy some oranges, to share with the passengers. Two ladies with a small child are sitting next to me in the bus. The baby is quiet and keeps staring at me. Good company to eat some of the oranges. The gesture is appreciated. Two hours later at 12:00 we arrive in Keren. At the bus station I order a pink colored fruit juice called "zeitun" for 6 Nakfa, and another one, before I walk to bar and restaurant Stuttgart to great Elen and her daughters Rahel and Hidat. By now they are like sisters to me. I am invited to their coffee ceremony at 15:00. I walk through Keren and visit friends, family of friends, neighbors of friends. When I deliver some pictures in a small grocery shop, they insist I will return tomorrow to join a coffee ceremony, or to drink tea. 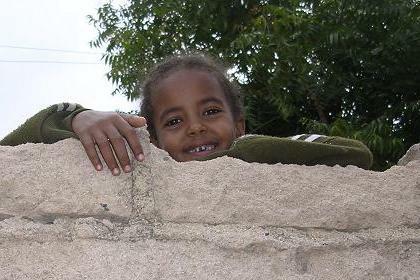 When it starts to rain, I take shelter in the house of Timkotu and Kidane, the neighbors of Hansu and Afworki. We drink tea with some bread, called hembesha. When the rain stops I walk back to Elen's place. As a gift I leave her a hand full of pencils. I should have bought something more appropriate, but there is no pastry shops in this part of town. Visitors ask me of I have a pencil for them as well. 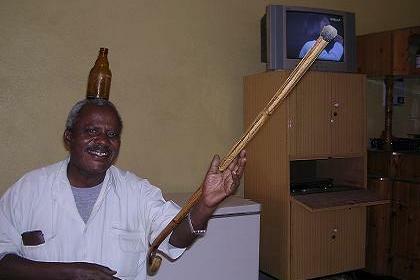 One of the visitors demonstrates his dancing skills, dancing with a beer bottle on his head. I reward him with another beer. He wants me to share his table and drink with him. We drink a few beers, until sunset. Finally I return to the house of Hansu and Afworki, where I will sleep a couple of nights. In the shop next to their house I buy a bottle of Araki, as a gift. Hansu makes me an egg burger and prepares my room. Two shots of Araki and than to bed. The climate in Keren is fantastic for a good nights rest. 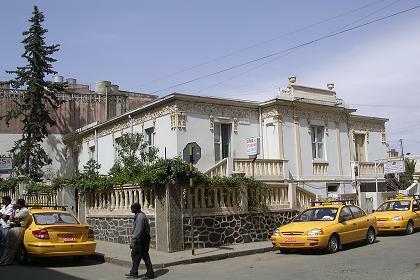 Beautiful Italian villa - Asmara Eritrea. 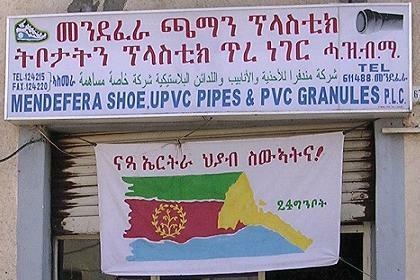 Decorated shop - Asmara Eritrea. 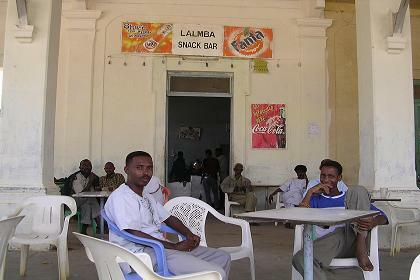 Lalmba Snack Bar at the bus station - Keren Eritrea. 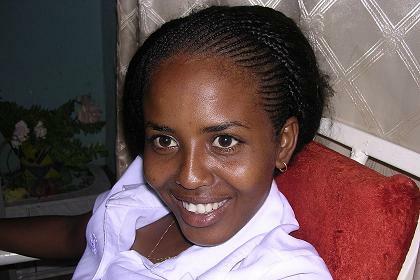 Elen - Stuttgart bar and restaurant - Keren Eritrea. 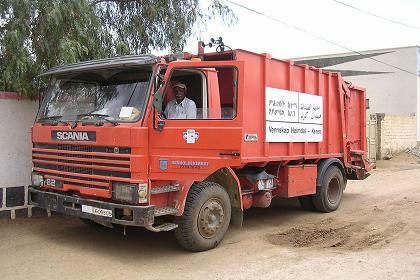 Truck donated to the municipality of Keren by Vennskap Heimdal - Keren. 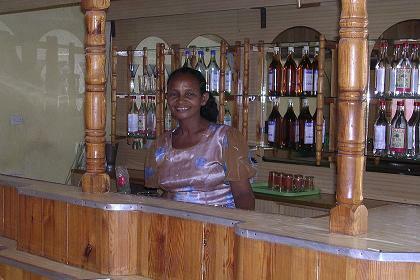 Visitor dancing in Elen's bar - Keren Eritrea. 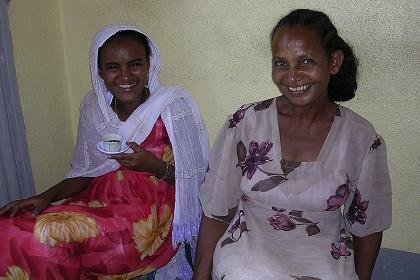 Elen and her sister Woiny - Keren Eritrea. Se'alena! 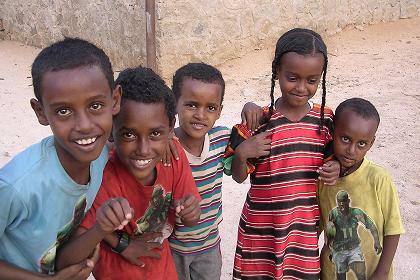 (picture us) - Local children - Keren Eritrea.